We are proud to announce that we have partnered with Gwen Jorgensen for the 2015 season and through the 2016 Olympic Games. Jorgensen is a member of the USA Triathlon National Team, raced at the 2012 London Olympics, and is the current reigning ITU World Triathlon Series Champion. Her accelerated rise through the elite ranks has seen her set new records, including winning four World Triathlon Series events in a row. After qualifying for Elite status in her first race in 2010, Jorgensen has gone on to post an impressive list of victories and firsts. Her accomplishments include being member of the 2012 Olympic team, being the first American female to win an ITU WTS event, and being the ITU WTS World Champion in 2014. With her recent win at WTS Yokohama, Gwen extended the longest men’s or women’s win streak in WTS series history. 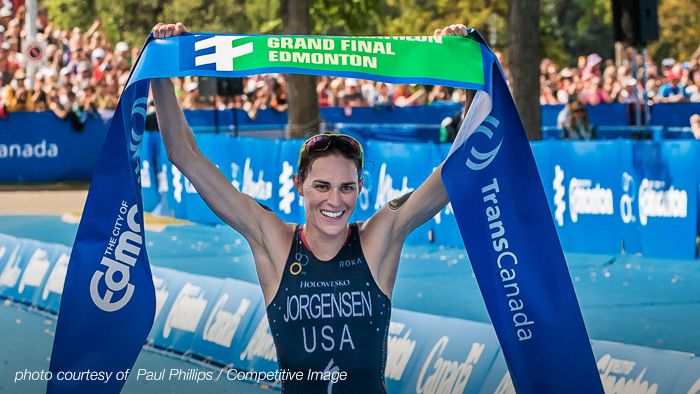 Jorgensen has earned an unprecedented 9 consecutive WTS victories and she has not lost a WTS race since April 2014. Gwen currently holds the No. 1 position in the Columbia Threadneedle Rankings. Jorgensen continues to rack up victories in 2015 while pursuing her goal of winning Gold at the 2016 Olympic Games.